Santorini known for its black volcanic soil beaches, whitewashed buildings and dramatic views, has been named the top European island destination and the fifth internationally, according to TripAdvisor tour operator’s annual list in which Greek islands took four of the slots, joined by Cephalonia, Naxos, and Zakynthos. View of the caldera of Santorini from Fira town, with the young volcanic island of Nea Kameni in the background. The TripAdvisor΄s list of the Europe΄s best islands was based on millions of reviews and ratings by international tourists on the travel website over the past year. No surprises here, because anyone who has visited the island of Santorini can totally agree. Famous for its unique landscape of gleaming white churches and sparkling blue seas, Santorini is one of the most photographed parts of Greece. 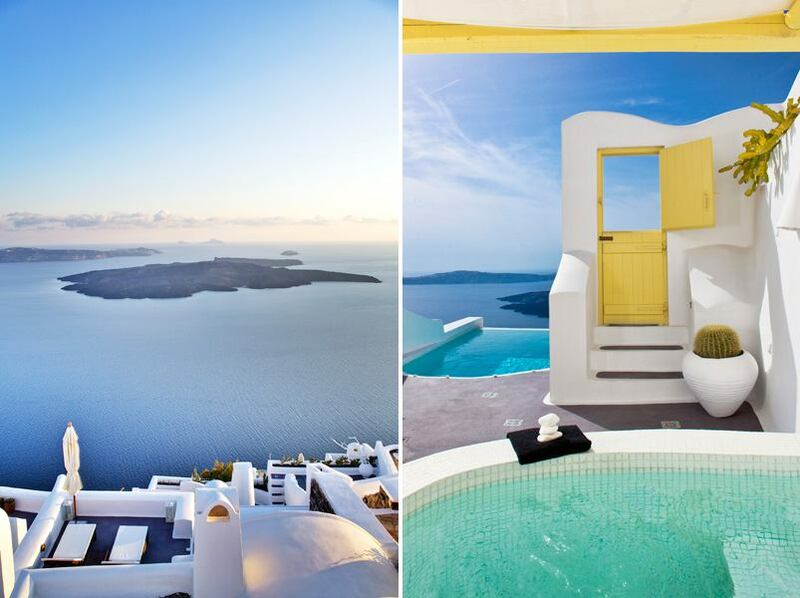 Aenaon Villas, Santorini, Greece, your ticket to an amazing journey! When the island of Santorini is your destination, it will become a destination for life. A unique complex in a unique location. At the top of a steep slope, at the narrowest part of the island where the land was carved to admire an endless horizon, the deep blue of the Aegean Sea, the caldera, the volcano and breathtaking sunsets. The combination of the brlliant white with the volcanic Santorinian stone has created a traditional complex of luxurious villas whose beautiful stonework evokes a feeling of rough grandeur. The result proves, that respect for tradition can coexist in perfect harmony with the luxuries of modern facilities. Dreams Luxury Suites is the place where style, opulence, and perfection meet a world of beauty and tradition. They represent a new concept of sanctuary with just four luxury suites that have a unique personality, and combine courteous and warm service with authentic tradition. The Suites were designed for the distinctive guest who is able to appreciate a singular kind of comfort, class, space and tranquillity. Each Luxury Suite is designed in the traditional Cycladic style, and has its own terrace with a Swimming Pool or Jacuzzi overlooking the Caldera and the Aegean Sea. Suites have stayed true to the original style of the Island and represent an inimitable sample of traditional Greek architecture. The privileged location of the Suites provide a nearly step free access. These original houses were built more than 100 years ago, and renovated during 2007 by the talented local designer Francesca Tsempeli. They incorporate all possible modern amenities, while preserving the traditional architecture.